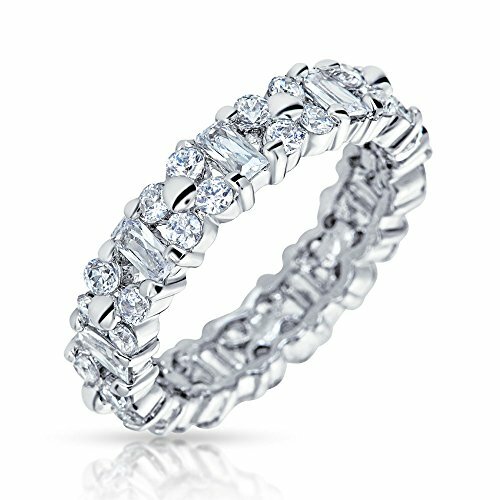 There is no better way to let everyone know your love is eternal than with one of our eternity style wedding bands. This sterling silver ring adds significance to the shine with alternating cuts of sparkling cz jewelry stones. Both the Emerald Cut and round cut stones of this cz ring will add that extra bit of beauty with everything she wears, including on your big day since they actually make gorgeous wedding bands. Do get one for your I Dos today. If you have any questions about this product by Bling Jewelry, contact us by completing and submitting the form below. If you are looking for a specif part number, please include it with your message.